WASHINGTON (CNS) — Christians of different faith traditions gathering to pray, to work together for a better world and to express love for others despite differences can provide a powerful witness and example in a divisive world, said a U.S. bishop who specializes in relations between Christians and interfaith groups. Bishop Joseph C. Bambera, chairman of the U.S. Conference of Catholic Bishops’ Committee on Ecumenical and Interreligious Affairs, said during a Jan. 18 interview with Catholic News Service that unity among all people is “at the heart of the mission of the church.” He attended various events in Washington in mid-January to put actions behind the intentions of the Week of Prayer for Christian Unity, an international Christian ecumenical observance. “As leaders in the church, and our people, (we) as members of religious traditions, need to profess, proclaim and live a spirit of unity,” he said. “We have to give witness to what we say is so wrong when we see hatred, when Christians and Muslims are being slaughtered simply for what they believe. 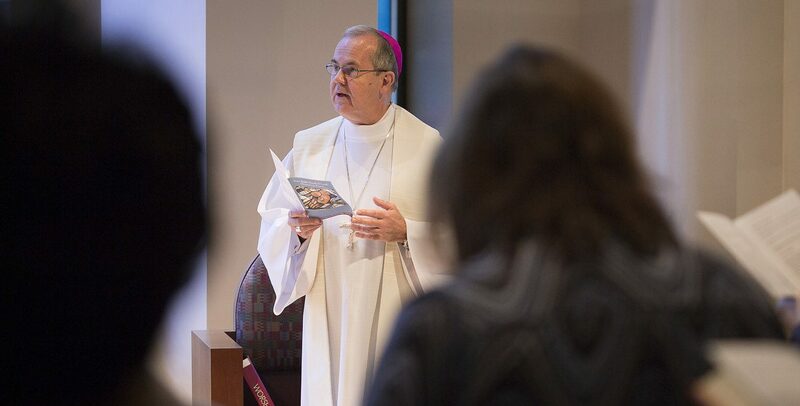 That may mean bringing unified prayer to action by working together in shelters to help the poor, homeless and hungry, advocating together for common social causes, and a variety of other activities to work for the common good, Bishop Bambera said. “There will still be divisions among our churches after this week of prayer,” he said. “But wouldn’t it be a wonderful thing if we could join in for basic beliefs that go across denominations and even faith traditions, proclaiming respect for human life? To kick off the week, celebrated Jan. 18-25, Bishop Bambera participated Jan. 17 in an “Evening Prayer Service for Christian Unity” at Washington’s Franciscan Monastery of the Holy Land. It included a joint ceremony with James Winkler, president and general secretary of the National Council of Churches, which represents congregations from Protestant, Anglican, Orthodox, evangelical, historic African-American and Living Peace traditions. Together, members of various Christian faith traditions sang hymns, prayed and voiced common concerns. Winkler mentioned how across the years, faith leaders have faced down evil, including war and Nazism, and joined together to support the country’s civil rights movement. More recently, faith leaders have expressed concerns for church leaders and their members in Cuba, Korea and Palestine so that American Christians will mobilize and “change our nation’s policies away from cruelty and confrontation and toward justice and peace,” Winkler said. He added that later this year many people of faith will gather in Washington for a march to end racism, which will include many Catholic groups, such as the Franciscan Action Network and in which members of the Catholic bishops’ conference also have expressed interest in participating, he said. The week always begins on the feast of St. Peter’s Chair in Rome (Jan. 18) and ends on the feast of the Conversion of St. Paul (Jan. 25).